Today, I am bringing you a requested dish especially now that Ramadan is around the corner. Its delicious, its healthy, and its super easy to make. Plus, everyone loves it! 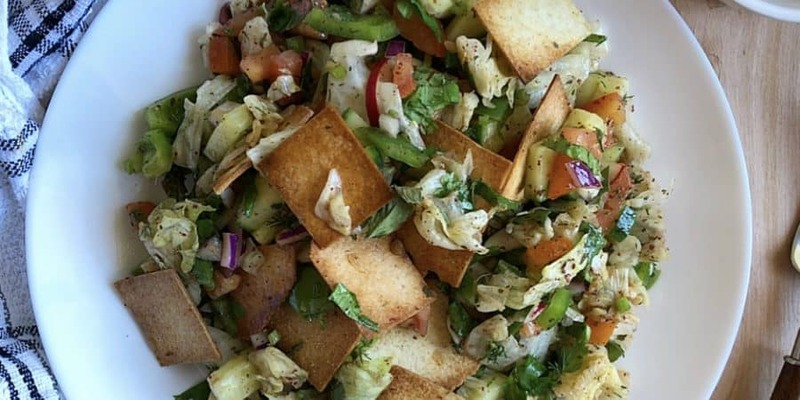 I don’t know about you, but fattoush is a staple on our dinner table in Ramadan or in gatherings. You will always see it offered at any Middle Eastern restaurant as well. Its one of the most popular Mediterranean salad’s next to tabbouleh. 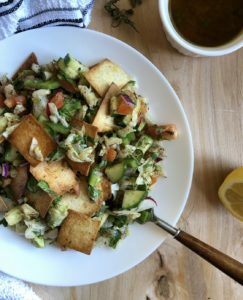 Its a simple chopped salad but what really elevates it; is the zesty dressing. The best part about the dish in my opinion is the crisp bread that soaks up some of the flavors of the vinaigrette. Components of the salad can easily be prepped ahead of time but don’t make too much ahead of time because the bread will get soggy. In a 350 degree oven, bake the pita or tortilla squares on a baking sheet. Drizzle the bread with oil and some garlic powder. Bake for 5 minutes or so till crisp. Keep an eye on it. In a large bowl, mix together all the chopped vegetables and herbs. In a small bowl, mix together all the dressing ingredients very well. When ready to eat, add 2-3 tbsp of the dressing to the salad and mix well. You will have leftover dressing which is perfect for other dishes too or when you want to make salad again. I absolutely love this recipe! 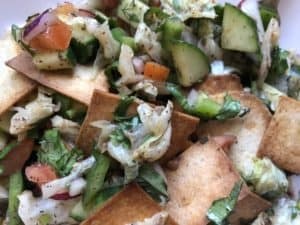 Ever since it was posted, I would constantly come back here and use this recipe to make fattoush! It taste amazing and just like restaurant quality! I love it!